The life of a lemon bread. 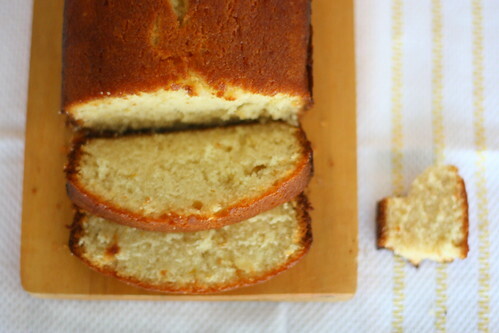 There is some zesting of lemon, and a mixing bowl or two, and an amazing smell of baked lemon bread filling the house. Make sure to hang around for that smell. I suggest leaving the kitchen for a few minutes and enjoying the aroma from a different room, just to really embrace the effect that sweet lemon can have on a home on a cold winter day. It's really one of the best parts. 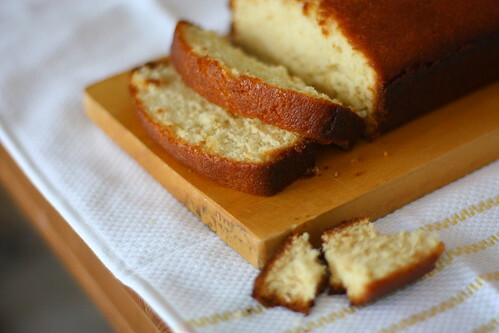 Then, there is a week of eating lemon bread for breakfast, after dinner, and before bed. It's best to just set the loaf on the counter, on a cutting board, wrapped in cling wrap or aluminum foil, with a knife handy at all times. From there, you can slice off a piece whenever you want. This bread goes especially nicely with a tall glass of milk. It also makes a very nice snack while writing a blog post. Just saying. Here's another good part: This bread is really cake. But you pour the batter into a loaf pan, and just like that, it's bread. 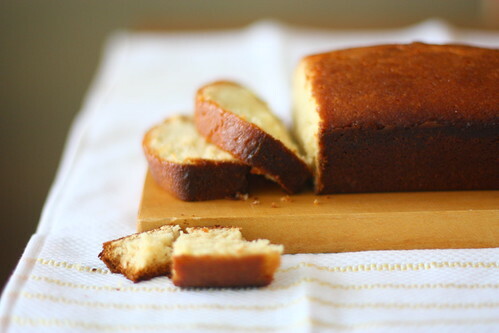 So you can slice it up like bread, and eat it for breakfast and before bed, and even while you blog, and all the while, there is this sweet, gooey, lemony glaze that has saturated the top crust, and it quietly screams "Cake!" as you break it apart and eat it with your bare hands, at any time of day. 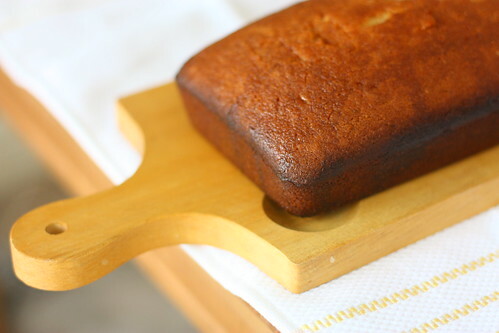 In the end, after the week is up, there is another loaf of lemon bread, bright and freshly baked. Eat, enjoy, repeat. I used Meyer lemons for both loaves, and they were delicious. Preheat oven to 350°F. Butter a 4x8-inch or 5x9-inch loaf pan. Sift together the flour, salt, and baking powder in a medium-sized bowl. Set aside. With a mixer, beat the butter until fluffy, about 2 minutes. Add the sugar and honey, continue to beat until creamy, a few minutes more. Add eggs, one at a time, beating after each addition to incorporate. On low speed, slowly beat the milk in. Do not worry if the mixture looks a little curdled. Mix in lemon zest. Add the flour mixture to the wet ingredients, beating until smooth. Pour the batter into the prepared pan and bake for 1 hour at 350°F. While the lemon bread is baking, prepare the glaze. Heat the glaze ingredients in a small saucepan on low heat until the sugar is completely dissolved. When the bread is done, poke holes all over the top with a thin skewer or toothpick (this will help the glaze penetrate). Spoon the glaze over it while the bread is still in the pan and is still hot. Use a brush to make sure every corner is covered. Use all of the glaze! Let cool for 10 minutes before removing from pan and slicing to serve. i'd have a slice of this with tea for my 3pm snack... it'll make me yearn for Spring like something fierce but still, it'd be so delightful. oh my. you had me at lemons. i think i need this. My mom used to make a really great lemon loaf! It is like cake and so good. I'd love a slice right now, please. This looks too good! I was actually planning to use some meyer lemons tonight for a cake and you definitely just convinced me! Nom nom nom. 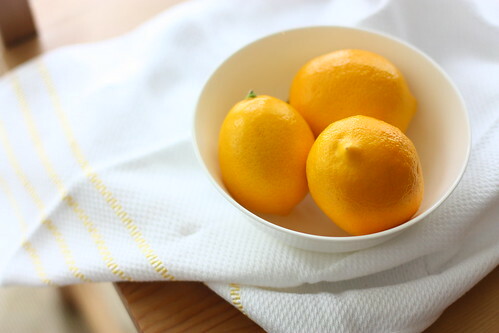 I love the picture of the lemons...they look so bright and fresh! I might just make the glaze and bathe in it. Okay, okay, I'll make the bread, too. 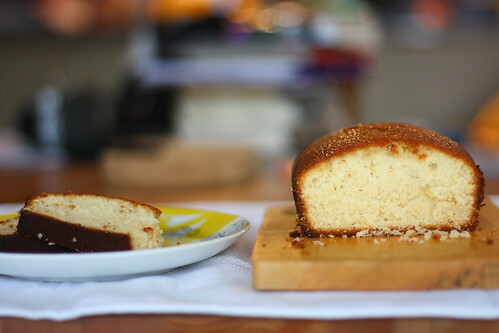 How could I resist a cake hiding in a bread loaf? Happy Monday, Jacqui! Thanks for sharing. So well written. What a sneaky cake! Martin - Thank you! Definitely try this. Angry Asian - This bread is perfect at any time of day. And yes, a perfect way to brighten up an otherwise cold winter. Shanna - Right?! Lemon anything sounds good to me. kickpleat - Oh mom recipes are the best! I'd like a slice right now, too. Laken - Yes! Let me know how it turns out! Dana - Thank you! Sneaky - ha! I like that. Char - Do it. Lemon rules. Yum! It is fun (and dangerous) to have a baked good on the counter to slice into when you need a pick me up. This looks fantastic! Nicole - Thank you! Yes, this whole baking thing is dangerous all around. mmm cake! i mean bread :) i could really go for some lemon bread right now. this is going on my weekend baking list and i just happen to have a bag of lemons from my grandma's tree! Kale Caesar Salad. With fried chickpeas.